The Education committee is comprised of experienced professionals who are committed to providing educational services to our community. There are dedicated to insuring that the Board of Education syllabus is managed and delivered to our membership efficiently. The Board of Education has 3 certified programs that are globally recognized by the international community. The FX Dealing Certificate* The Model Code Certificate* and the ACI Operations Certificate. The executive committee can provide guidance and solutions to all our members concerning these courses. Furthermore, the Education committee will work towards creating seminars and presentations that focus on pertinent issues that confront our markets. The ACI Board of Education is currently in expanded talks with Stevens Institute of Technology in creating a working agreement on all educational programing, content, and quality. “ACI’s Education Mission is to promote the highest global standards of professionalism, competence, and ethics in the activities and products in financial markets through ongoing educational programs and examinations”. 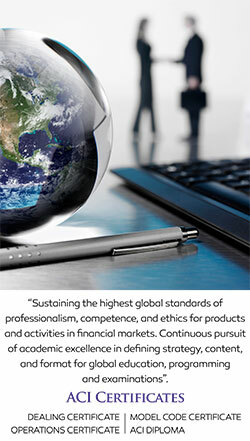 As the largest international professional body for dealers and back office personnel in the wholesale financial markets with membership in over 80 countries, ACI BOE is committed to providing globally acknowledged, portable, professional qualifications and educational opportunities that enhance career prospects, improve job performance, and set benchmarks within the industry. The ACI Suite of Exams is recognized by regulators and central banks, as well as by many banks and financial institutions all over the world. Recognition comes in many different ways. In some countries, ACI exams are officially accredited, e.g., by the FSA in the United Kingdom, the DSI Dutch Securities Institute, or the CBSL. In other countries, the exams are officially endorsed by the regulator, e.g. in Switzerland or they are simply by financial institutions as a requirement to work in a dealing room.